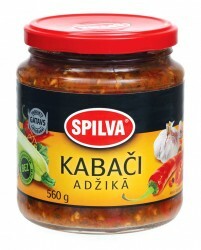 Squash in adjika is a new product in Latvian market and everyone who likes spicy products will love it. Piquant taste for product comes from garlic and chilli pepper mix. Squash in adjika will be good snack on it`s own as well as an additive for meat dishes. Spilva salads always taste good! Product 100 g contains: energy value – 100 kcal (422 kJ), protein – 1.4 g, carbohydrates – 14.8 g, fat – 4.0 g, salt – 1.6 g.